3D printed tissue is proving to be an effective means of testing new pharmaceuticals. Using 3D bioprinted tissue, scientists can create the kind of complex human tissue found in organs such as the heart, liver, kidneys, etc. and see right away the effects that a particular drug will have on those tissues inside the human body. 3D bioprinting is a great cause for excitement. Usually people’s minds go immediately to one idea: in the future,we may be able to 3D print working human organs that can actually be transplanted into patients. Thus the need for a donated organ from another person. It’s understandable that people are excited about that prospect; 3D bioprinted organs potentially carry tremendous advantages. People could receive lifesaving organ transplants right away, without having to wait for a donor match. The idea is that 3D printed organs are formed from the patient’s own stem cells. This helps to eliminate the risk of rejection and the need for immunosuppressive drugs. It’s easy to see progress like that and think, “Wow, we could be transplanting 3D printed organs into people by next year!” It’s not that simple, but the fact that scientists have been able to 3D print live tissue at all is incredible, and the technology is already saving lives in the form of cardiac patches, for example. Lives are being saved through a bioprinting application that gets less sensational attention. 3D printed tissue is proving to be an effective means of testing new pharmaceuticals, meaning that drugs can be thoroughly assessed and brought to market more quickly. The reason behind the failure of so many drugs is that even when a new drug works well on animals, its effects don’t necessarily translate to humans. Human physiology is very different from that of test subjects such as mice. What works for a mouse doesn’t always work for a person. 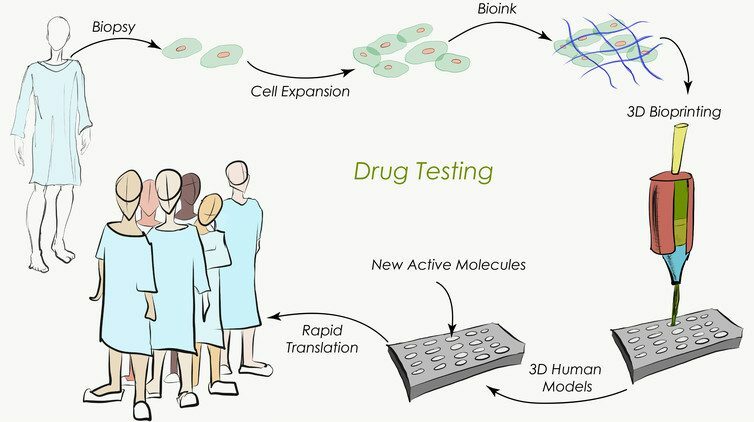 The more distinct types of 3D printed tissue that scientists are able to create, the better the possibilities become for more effective pharmaceutical testing. Bioprinting isn’t a one size fits all solution; different types of cells require very different types of environments in order to function properly.